← No Reagents for You! So some titles immediately became available to all of your characters as I’m sure you’ve noticed by now. Others show up for some, but not all of your characters. 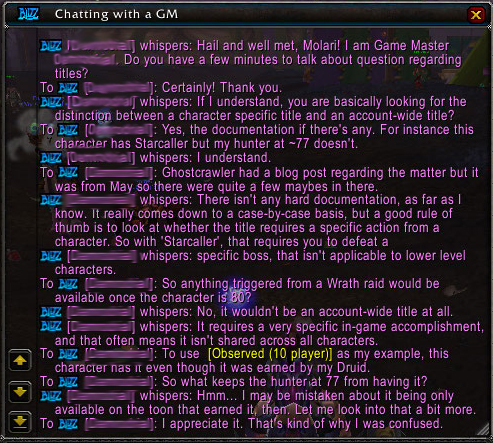 A GM gave me some of their valuable time to chat. So all the documentation right now on the patch notes links out to a Ghostcrawler blog from May. 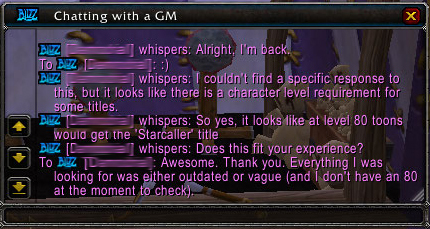 The final conclusion of the GM was that if you’re not high enough to have gotten the achievement on that character you wouldn’t have the title yet for that character. There isn’t specific documentation about it. Therefore if you’re 80+ you’ll get your Wrath achievement titles while holiday achievements that aren’t limited by raid access will trigger automatically and be available to even your level 1 Monk. So to have a Starcaller monk you’ll have to get that toon to 80 first. Happy hunting! This entry was posted in Achievements, Patch, Titles and tagged achievements, patch, titles, world of warcraft. Bookmark the permalink.